It’s all you Annie Hall! The always great Paste magazine shares their 50 Best Romantic Comedies of All Time and we thought you’d enjoy a little discussion around it. Cameron is represented by Jerry Maguire (#33) and Say Anything… (#7). Here’s the Top 20, but please visit Paste and check out the entire list. I personally love the inspired choices of WALL-E (#31), Waitress (#29) and Knocked Up (#18), but what are your favorites? What’s missing from their list? Singles… it made me want to wait until someone said “bless you”. Paste: 50 Best Romantic Comedies – The Uncool – The Official Site for Everything Cameron Crowe http://t.co/uUSlCknd4R I AGREE!!!! Looking at the full list I think the only thing I could argue about is placement. The essential romantic comedies look to be represented. Though I agree that “Moonstuck” and “Barefoot in the Park” probably should have been on there. While I don’t think it’s a classic maybe “My Best Friend’s Wedding” should have been on the list, at least when compared to some of the others that made it. A nice romantic comedy that’s funny and joyous even though the heroine doesn’t get the guy. Taken from the list my top ten, apart from Cameron’s films, are “His Girl Friday”, “It Happened One Night”, “Punch-Drunk Love”, “The Lady Eve”, “Clueless”, “Chasing Amy”, “The Apartment”, “The Philadelphia Story”, “Scott Pilgrim Vs. the World” & “Knocked Up”. PDL is a good call and a definite miss in the Top 20…. The very last scene is probably the most exhilarating ending to a romantic comedy I’ve ever scene–I applauded like mad in the theater when it ended. GREAT CHOICES. I FORGOT about THE LADY EVE and JUNO too maybe? Hannah and Her Sisters, Rushmore, My Best Friend’s Wedding. 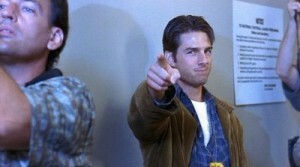 Jerry Maguire should be much, much higher on their list. And Broadcast News and Defending Your Life. Yes to these two!!! Which also brings to mind, where’s “Modern Romance”?! “Before Sunrise” doesn’t qualify as a rom-com? I guess not, or it would have made the list. Well *I* would include it. “Singles” too, of course. How about Dudley Moore’s ARTHUR? And even 10?